Back in the mid 70's, our family was taking care of an older gentleman. After his passing away, we had to clean out all of his personal items from his house. We came across this Mission clock that was put away in a closet for years. It was a clock made by the New Haven Clock Co. The label on the back said Mantel Mission Song. Also the word, 8 day and patent Oct.4th 1904 were also visible. Right after the first of the year (2009) the clock was finally taken out of the closet and we decided to wind up the old girl to see if she worked. The clock started ticking when we gave the pendulum a push and the clock would ring once on the half hour and the correct amount of bells would ring on the hour. The clock has it's original finish which is a rustic wood look and I have it on display in my family room. Also, the key for winding the clock remained inside when we opened the door. 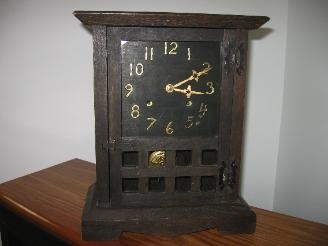 Mission Clocks were made by New Haven and several other American clock companies until about 1920. They were made to match the furniture styles of the day. They started to go out of style around 1915 or so. I believe they started to make these in the 1880's; at least that is the earliest that I have seen. Most Mission mantel clocks go at auction for $300 to $700 depending on condition. Antique stores would be higher. Mission wall clocks are more common and go for a little less.